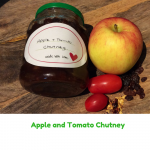 Apple and Tomato Chutney great with cheddar cheese and crackers. Thoroughly wash and peel the apples and chop into 1cm big pieces. Thinly slice the onions and cut the large dried fruit if you are using it into thin slices (raisins can be used whole). Then add the brown sugar (you can use either dark or light) and cook for 30 to 40 minutes until the chutney thickens to a jar like consistency. Stir every now then to ensure the mixture doesn't stick to the bottom of the pan. 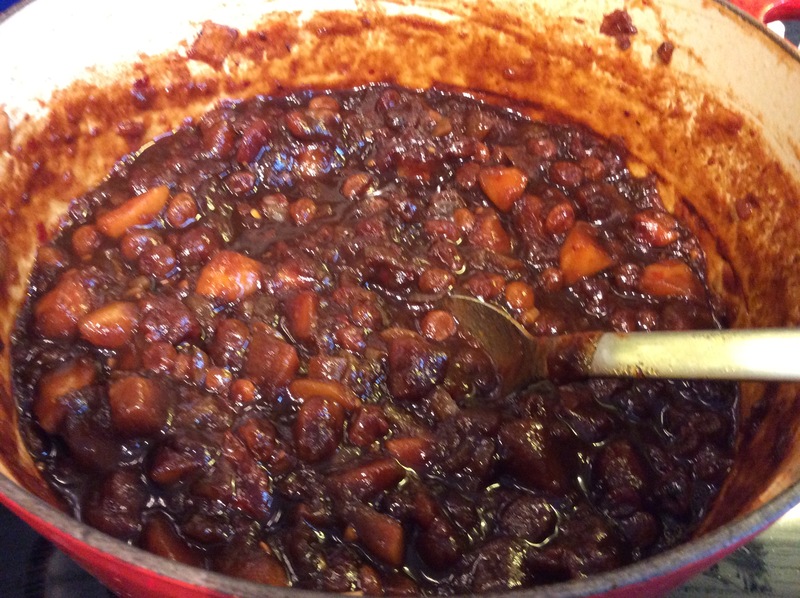 If the chutney is still too runny cook a little bit longer checking after every 5 minutes. Remove the cinnamon stick. 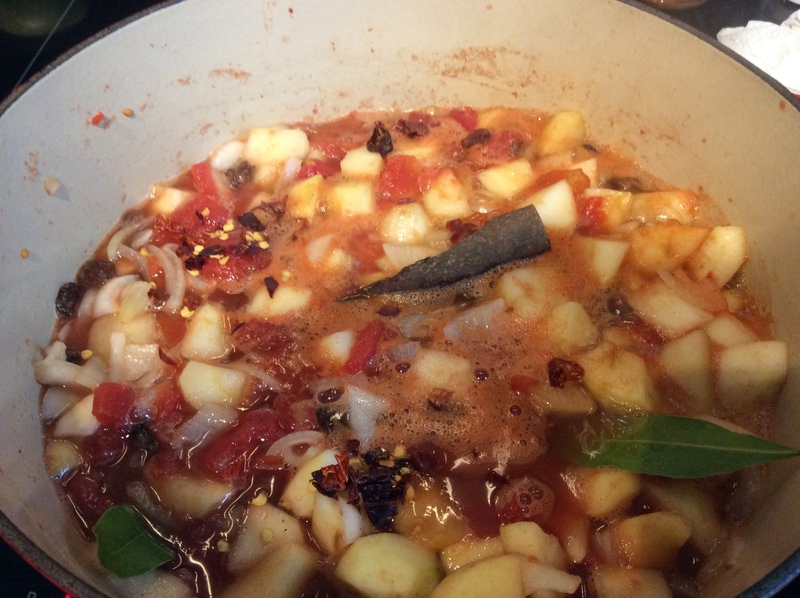 This is a simple recipe for Apple and Tomato Chutney. I have been making this recipe for several years and have finally gotten round to posting it. I have made it for Christmas presents for several of my friends and they have all loved it. I like this apple and tomato chutney as part of a traditional British ploughman’s lunch with bread, cheddar cheese and pickled onions. 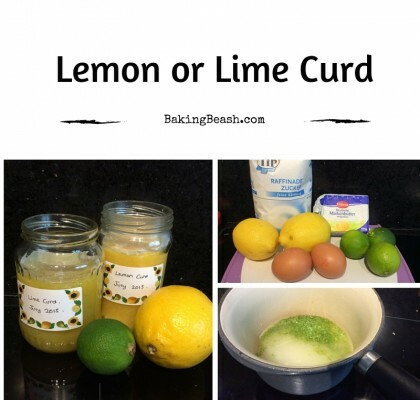 Be warned when you make this recipe it will make your house smell, its the vinegar. You can double up the quantities shown here to get more jars. 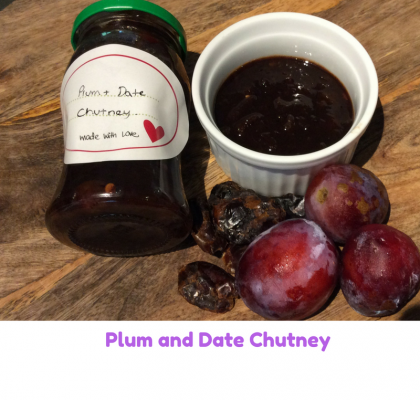 Another idea is to make another chutney at the same time check out my Plum and Date Chutney. To go with the apples you can use dried fruit, apricots, raisins or even dates all make good combinations. I have added some dried chilli to the spices if you want it too hot simply leave it out. This is the first year I have used home grown apples. If you also have a glut of tomatoes you can use homegrown fresh ones. For best results it is best to skin them by scoring the skins lightly with a knife soaking in boiling water and then rinsing in cold water before peeling them. This is a pain to do so a tin of good quality tomatoes is a lot easier to use. 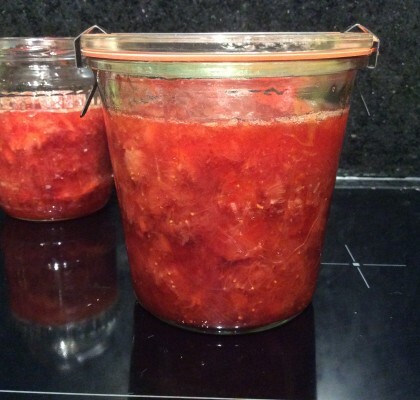 Store the cooked chutney in sterilised jars check out my page on How to sterilise jars. The chutney will keep for 1 year plus if unopened, if stored in a cool dark place (doesn’t need to be the fridge). Once you have opened the jar store it in the fridge.